I can't believe a week has passed by after months of anticipation leading up to last Saturday's big event. 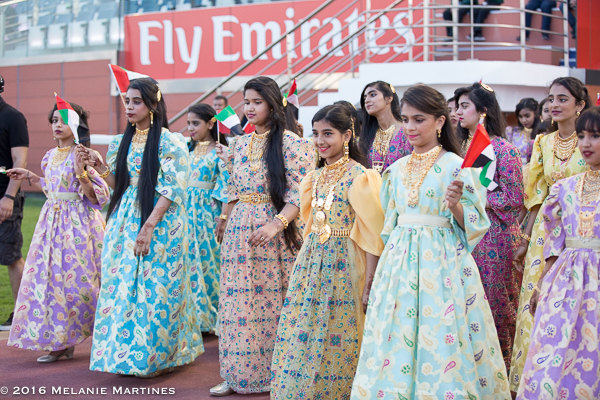 I remember wanting to savor every second of my eagerness since this was my first trip to Dubai, but oh, how time flies! Luckily, we are able to capture special moments in time through photos and videos so we can go back in time to reminisce. That's where I come in. I'm a Photographer and that's what I do. 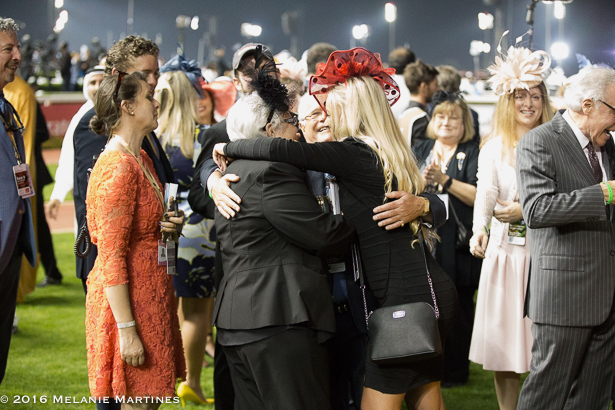 I capture moments in horse racing that bring you back in time, or take you places you can't be. Behind the camera is my favorite place to be. 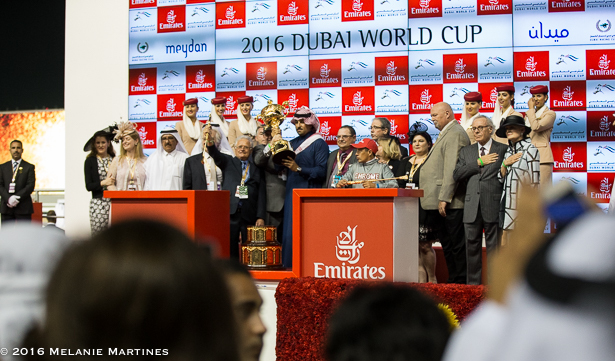 The Dubai World Cup is probably the biggest event I have documented and words can not express what an experience it was. 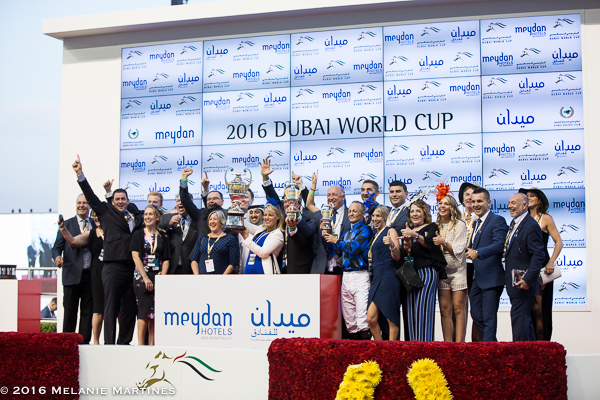 Each and every person in the media worked really hard in making sure the racing fans, and the world was up to date with the happenings during the Dubai World Cup week. We were there every morning, bright and cheery beating the sunrise as we welcomed each day. Despite my body clock being 11 hours behind Dubai, there was no shortage for adrenaline running through my blood. 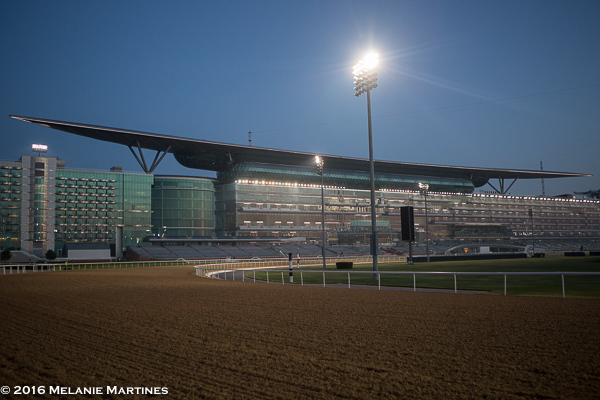 The thought of waking up at 3:30 am each morning and grabbing my camera as I left for Meydan, was my bold cup of coffee. The thrills that I was about to experience each day made my early mornings enjoyable. 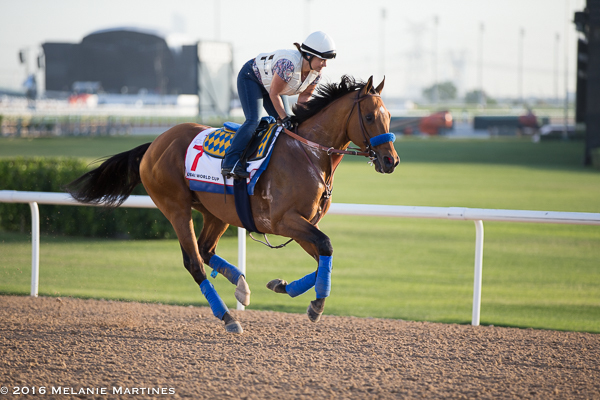 The morning workouts were our first glimpse of each contender as they gracefully galloped over the race track. 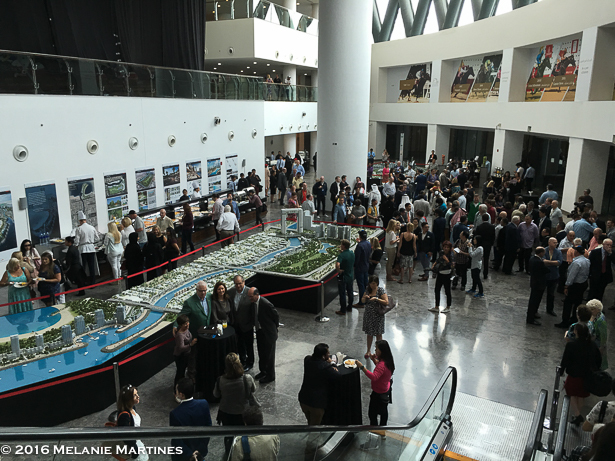 I got into Dubai four days before most of the media, which I'm glad I did because Meydan is a very large race track and I was able to slowly acclimate to the time zone as well as my surroundings. 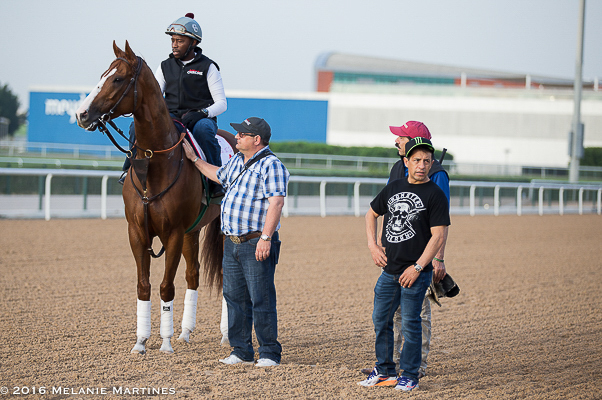 Here are some photos of horses on the track. 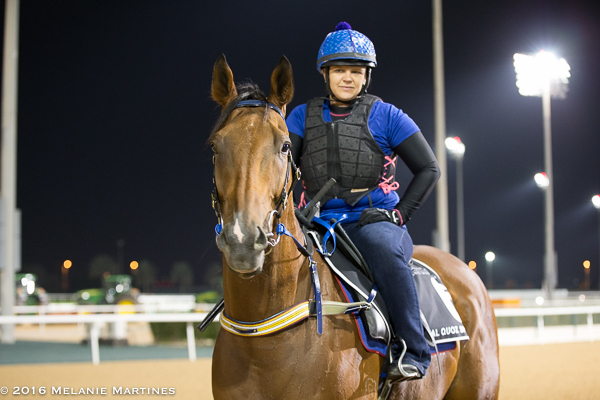 Here is the Al Quoz Sprint winner Buffering out before the sun. 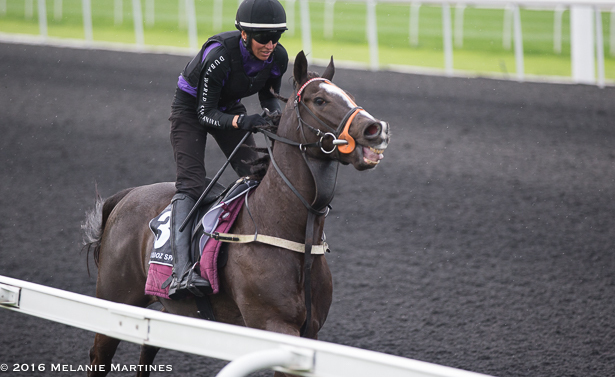 Hong Kong's hopeful Al Quoz Sprint Contender, Peniaphobia. 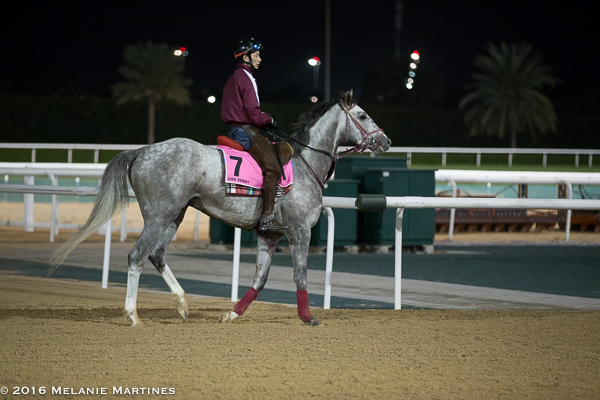 Japan's pride and joy UAE Derby Winner, Lani. The Japanese horses usually came out in the first session each morning. 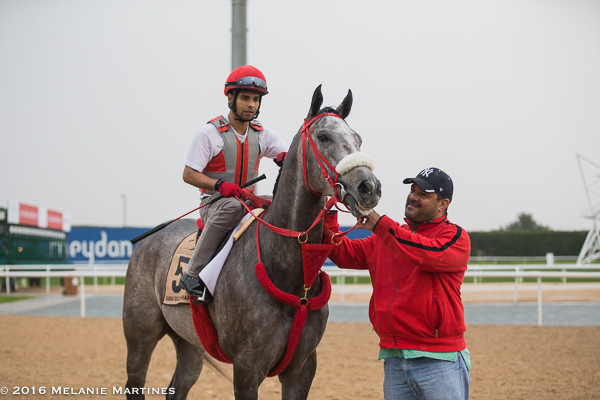 USA's Golden Shaheen Contender, X Y Jet with Trainer Jorge Navarro. 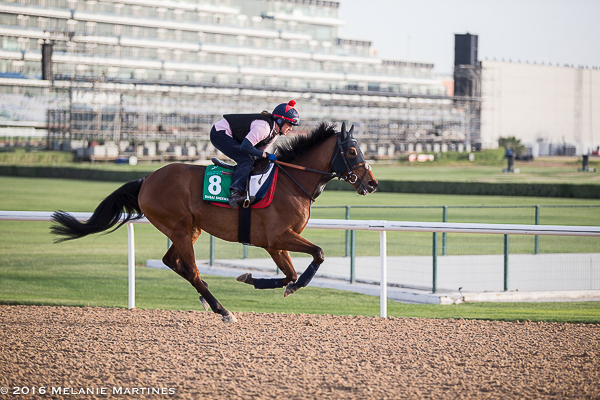 USA's UAE Derby Contender, Frank Conversation out for a morning gallop. 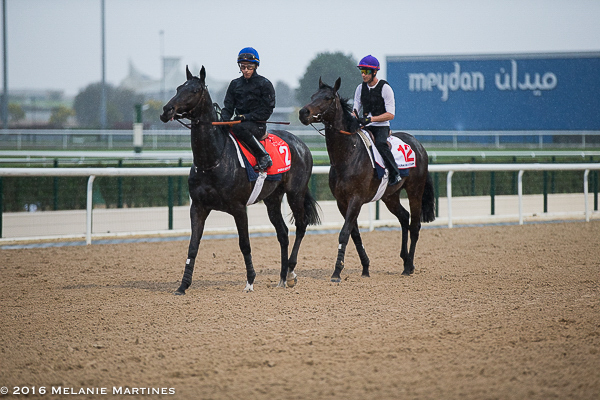 French horses, Gold Cup Contender Manatee (#2 Saddle Cloth), and Dubai World Cup Contender Vadamos. 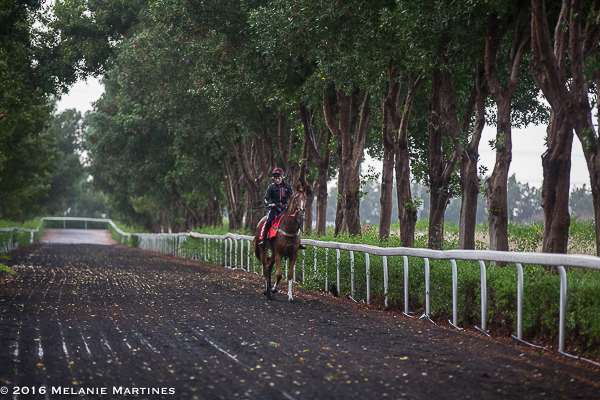 Out on one of the mornings that was cold and rainy was Godolphin Mile's Contender Sloane Avenue. Beautiful Arabian horse, Handassa stretching out and getting ready for the $1 Million Kahayla Classic (Race 1 on card for purebred Arabian Horses). 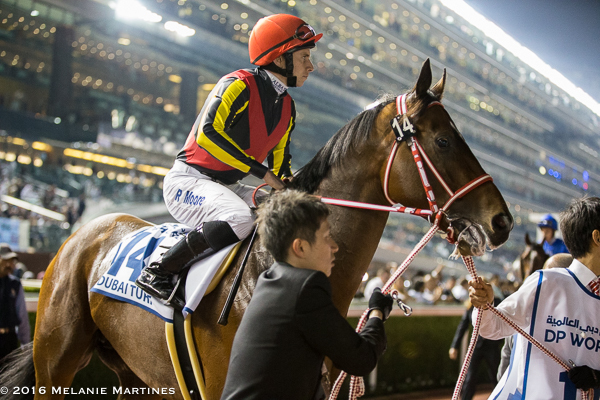 Hong Kong's Golden Shaheen Contender, 8-year-old Rich Tapestry. 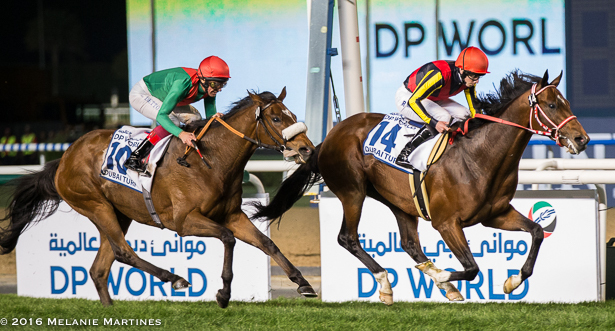 Horse with a cool name, Sheema Classic Contender Sheikhzayedroad. 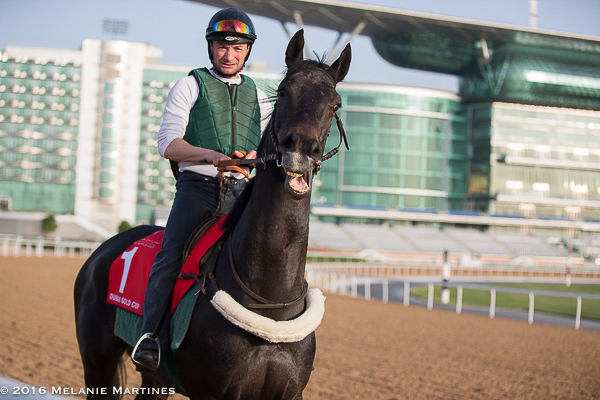 French superstar Gold Cup Winner, Vazirabad greeting me Good Morning. 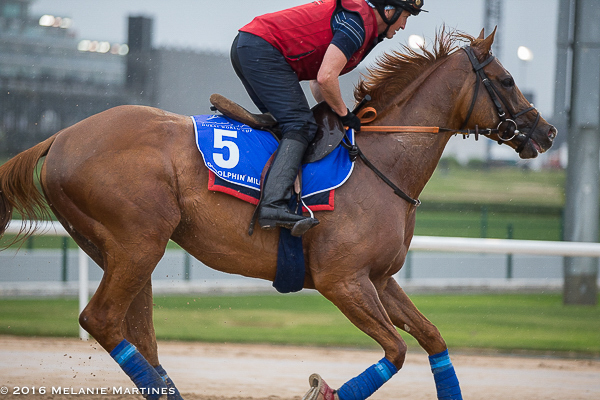 USA Contender in the Dubai World Cup Hopportunity looking fabulous. 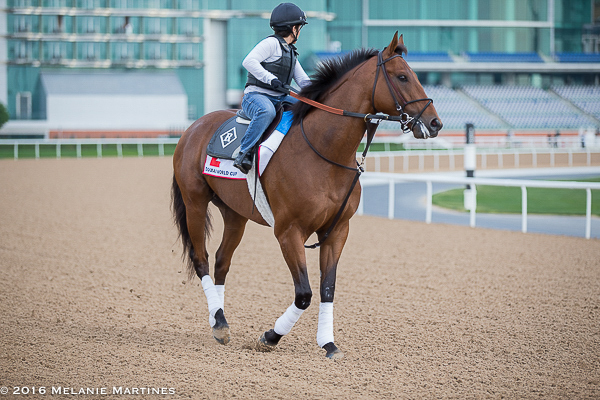 USA Contender in the Dubai World Cup Keen Ice looking majestic. 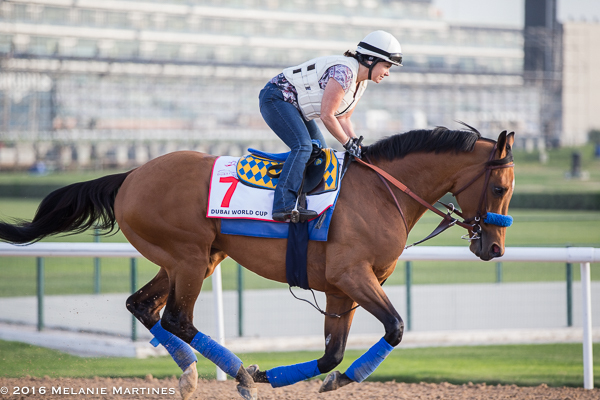 Keen Ice with Exercise Rider Tammy Fox enjoying the early morning. 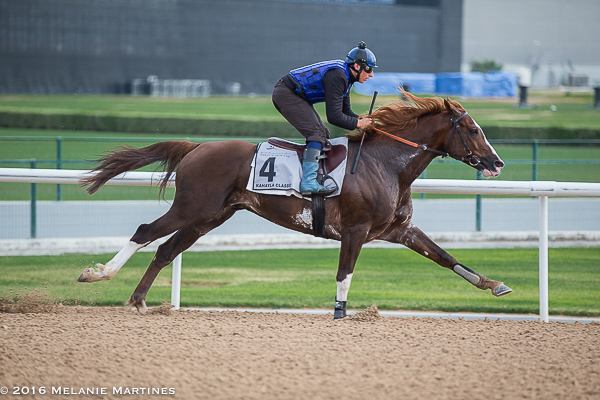 USA World Cup Contender Mshawish, looked really good on the track. 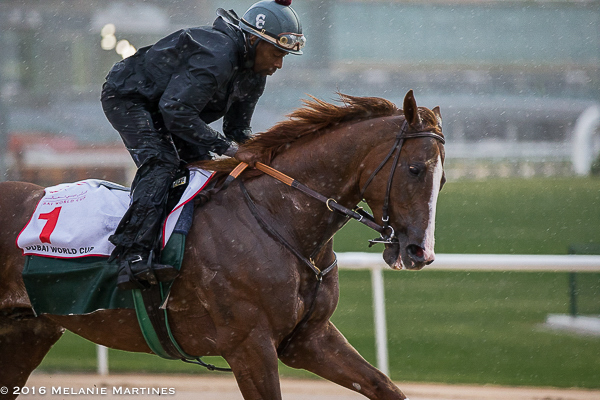 It was a very cold rainy morning, but this is one of my favorite photos of California Chrome galloping in the morning. Beautiful Chrome standing in the rain. 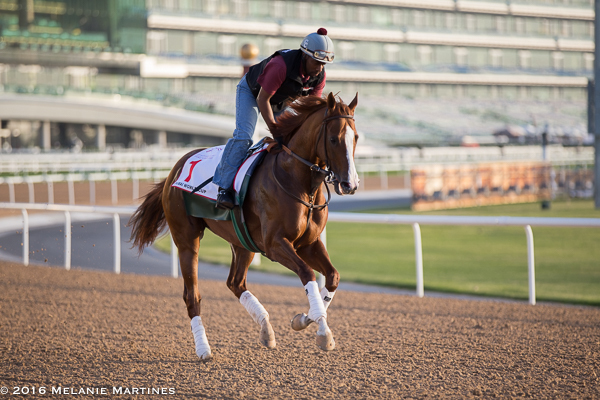 California Chrome looking amazing on the track. 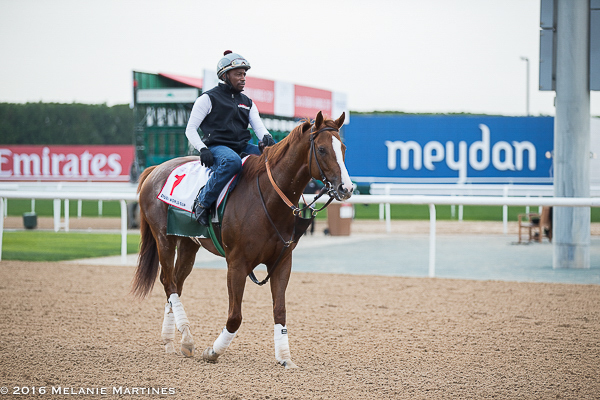 California Chrome looks at home in Meydan! 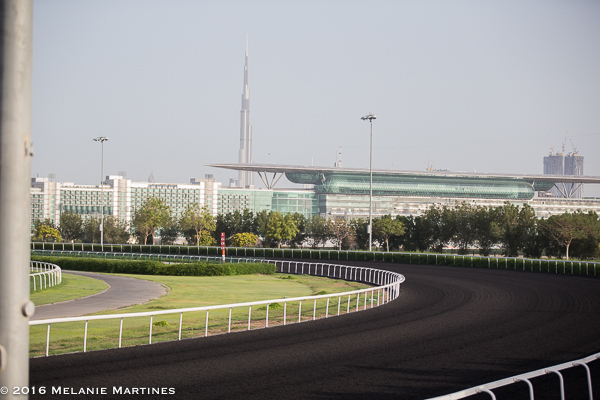 and a fabulous view of the Burj Kalifa. 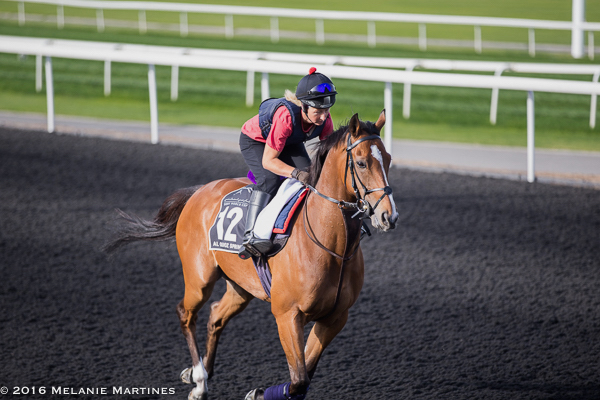 USA Dubai Turf Contender, Flamboyant trained over the Tapeta surface. 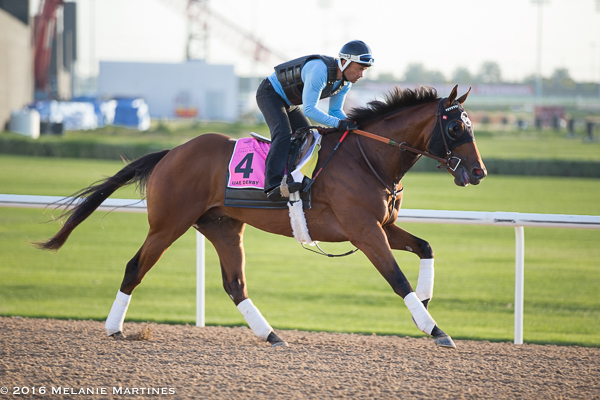 I love saying this horse's name, Al Quoz Sprint Contender, "Sir Maximillian". 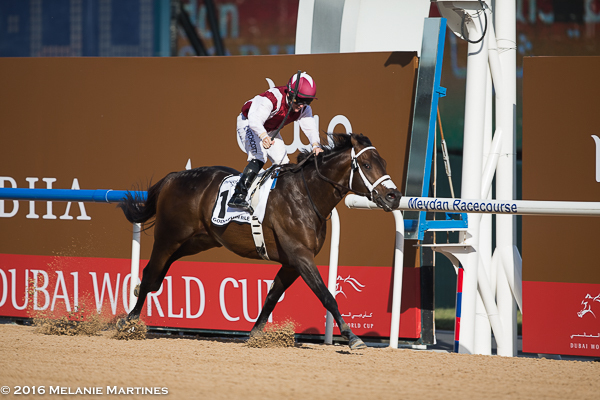 Al Quoz Sprint Contender, 9-year-old Sole Power. He was a handful during his morning gallops. Head strong and really entertaining to watch. This is one of my favorite photos from the race track. 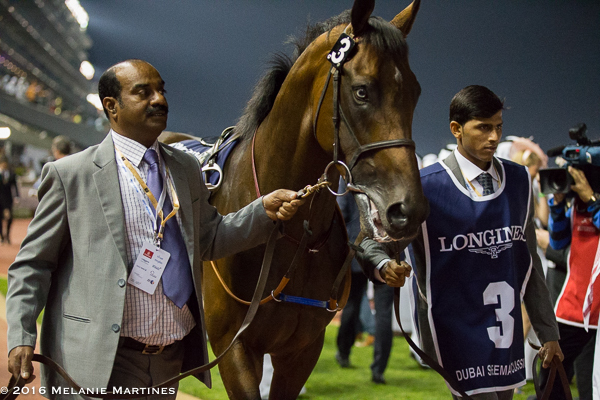 This is Gold Cup Contender, Suegioo. Wednesday was post position draw. 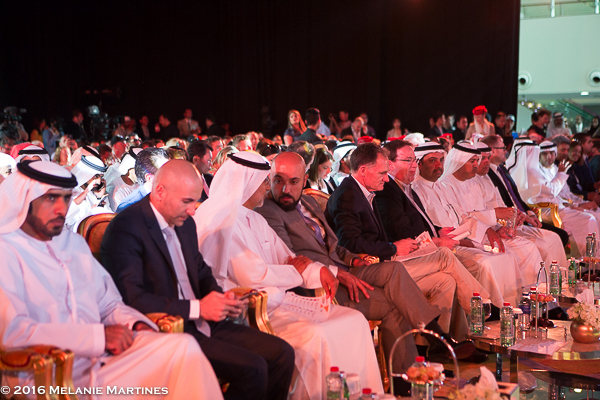 Media and racing connections filled the area with the anticipation of post positions for the contenders. 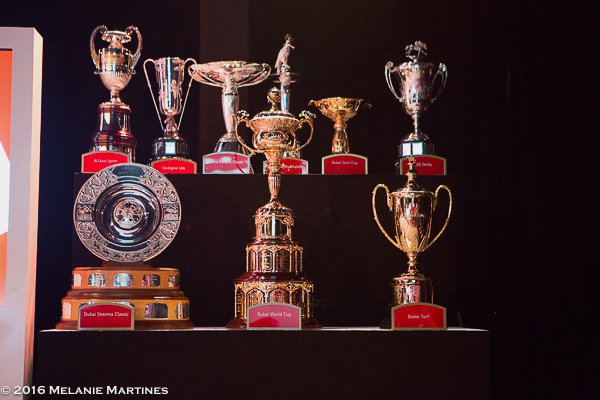 All eyes on the trophies. 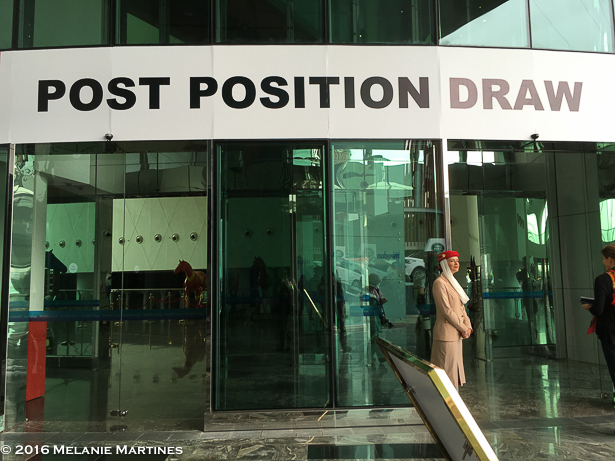 Post position for the Dubai World Cup. Saturday finally arrived! Race day! 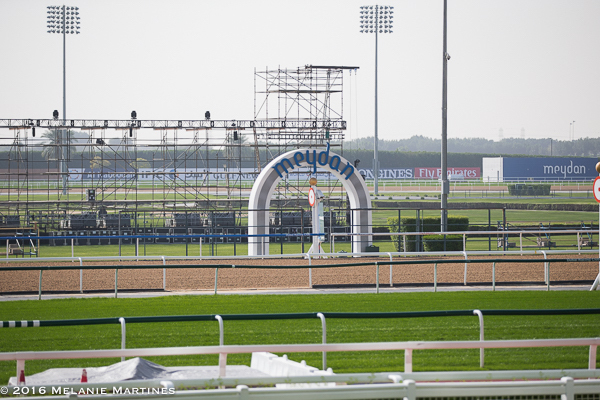 The arch of Meydan was the finish line for the dirt races. 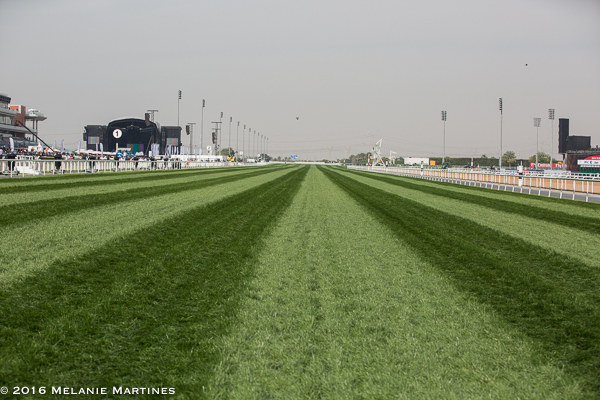 The turf was very different from what I have seen at race tracks in America. 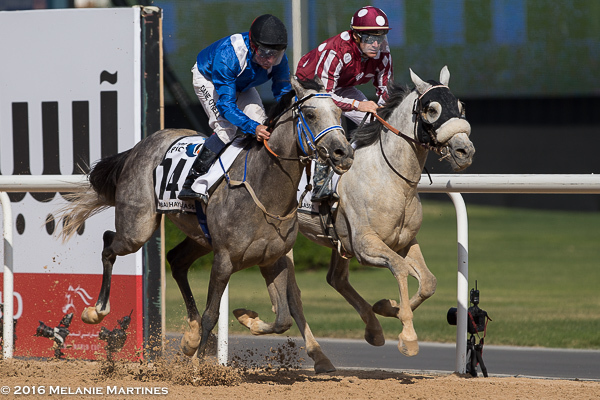 Race 1, the Kahayla Classic for purebred Arabians at 10F. It was an interesting race to start the afternoon. If you haven't seen the race you can watch it on YouTube. 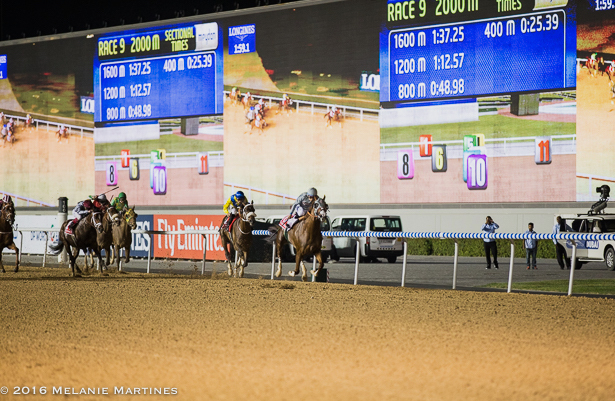 #12 Thakif led the entire way and looked really strong until he had a 150 meters to go. That's when he hit a wall and started to run to the center of the track (horse to the left of the photo). He was out of gas, but managed to end up third. The race went on with two grays battling nose-to-nose. #14 Mathmoon was victorious over Thunder Struck. 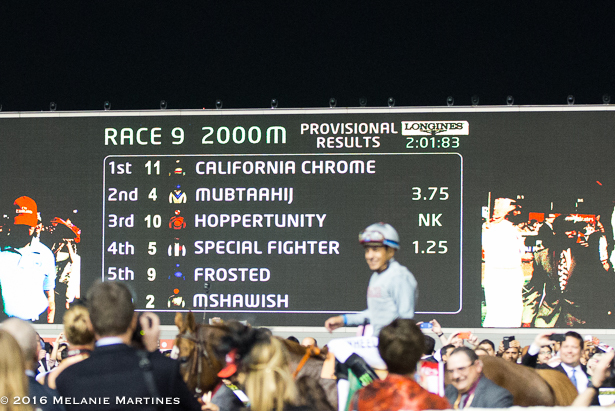 Race 2, the Godolphin Mile with a purse of $1 Million at 8F. 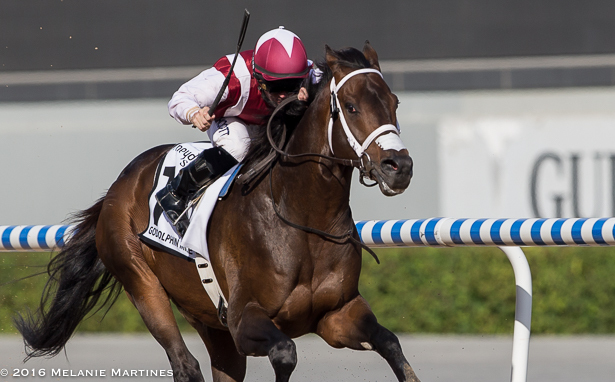 #1 One Man Band went wire-to-wire with Faulkner digging deep to pass Cool Cowboy for second. It was a nice trifecta for Trainer Doug Watson placing 1-2-3. Here is the winner heading home. 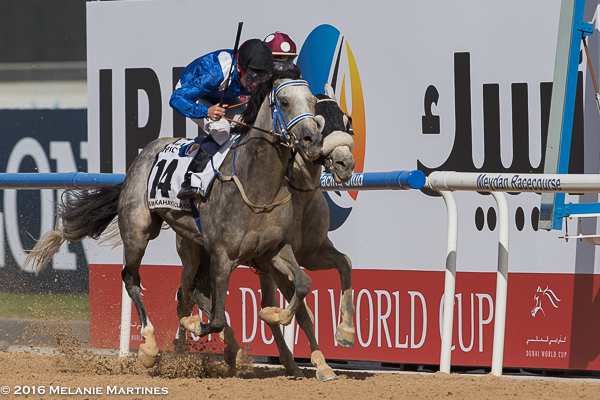 Winner of the Godolphin Mile, One Man Band. 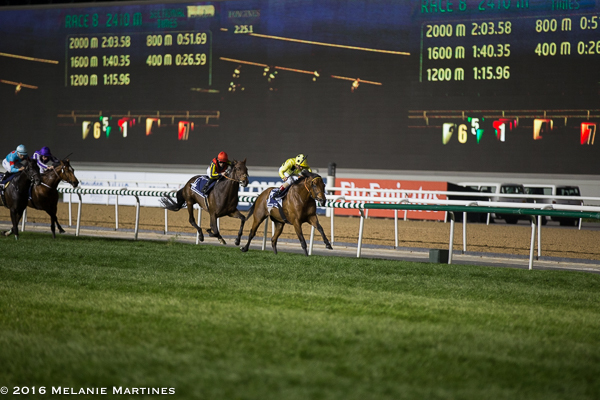 Race 3, the Dubai Gold Cup with a purse of $1 Million at 16F. 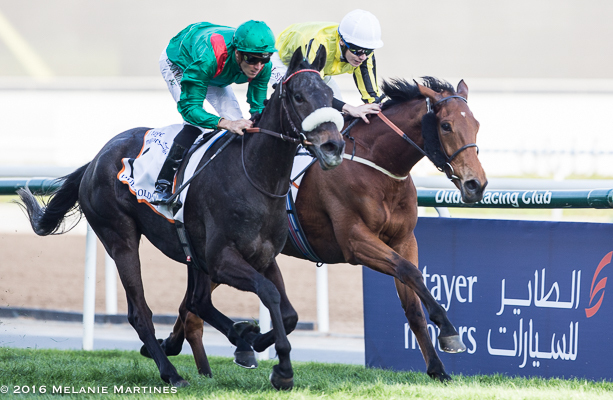 Favorite Vazirabad trailed the field with Certerach leading the way and Big Orange pressing the pace. 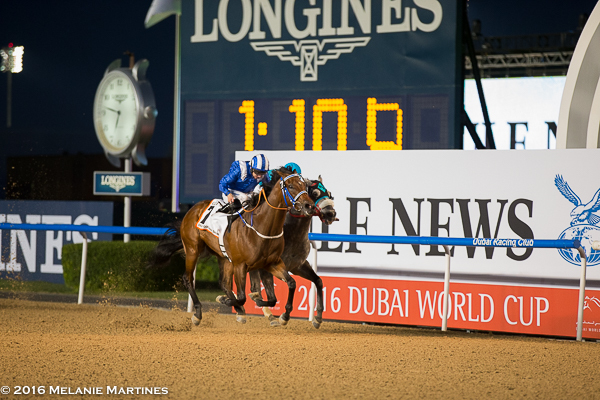 At 400 meters Vazirabad made his sweeping move reeling in Big Orange for a thrilling finish, winning by a neck. 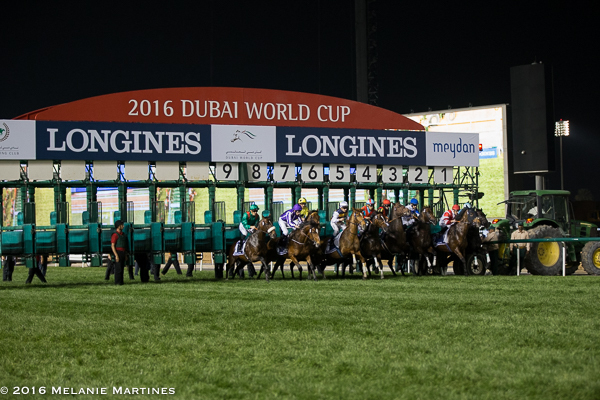 Race 4, the UAE Derby with a purse of $2 Million at 9.5F and 100 points toward the leaderboard in the Kentucky Derby for 3-year-old colts. Here is filly Polar River getting ready to take on the boys. 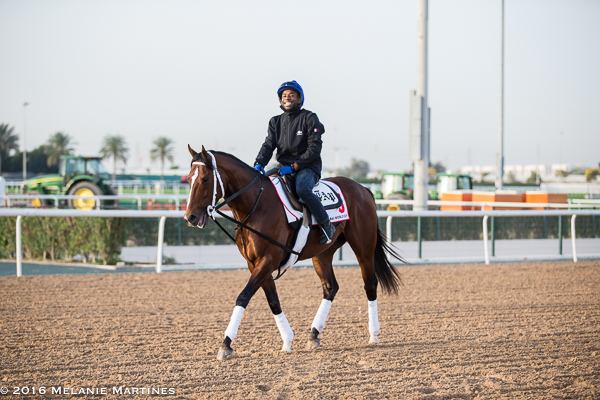 Representing the USA was Trainer Doug O'Neil's Frank Conversation. At the break, #3 Lani bobbled a bit out of the gate. 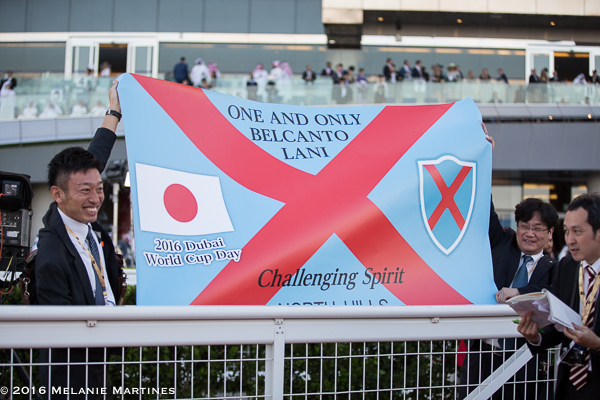 At the top of the bend, Yu Change took the lead with Lani close behind. 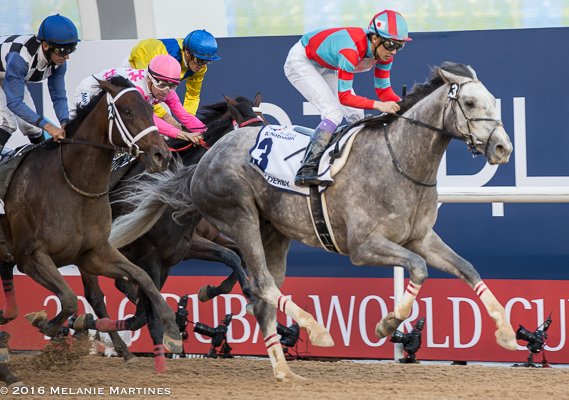 Lani gets to Yu Change, and the filly Polar River battled down the stretch for second. 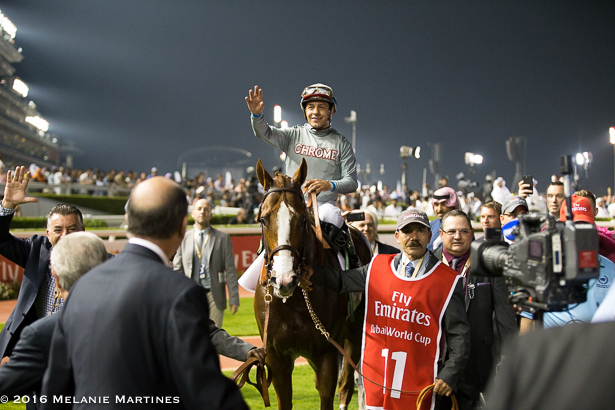 Japan takes the UAE Derby and Lani is on his way to the Kentucky Derby! 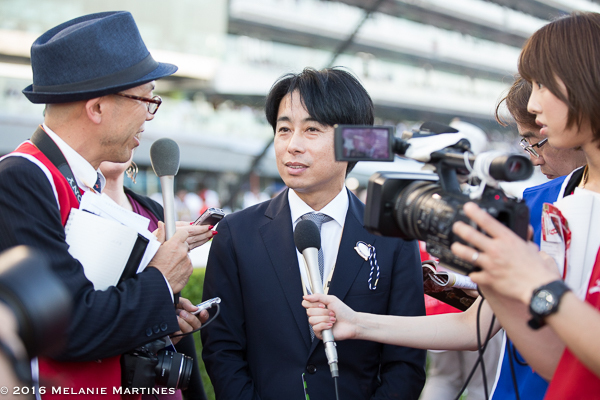 Trainer of Lani, Mikio Matsunaga being interviewed by Media. Japan was very happy for the win! 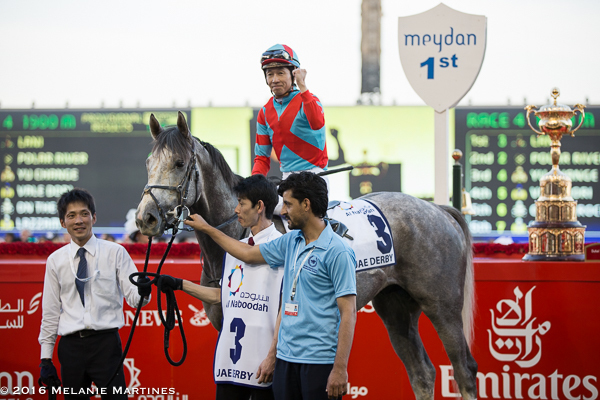 Jockey Yutaka Take and Lani, winner of the UAE Derby in the Winner's Circle. Race 5, the Al Quoz Sprint with a purse of $1 Million at 5F. 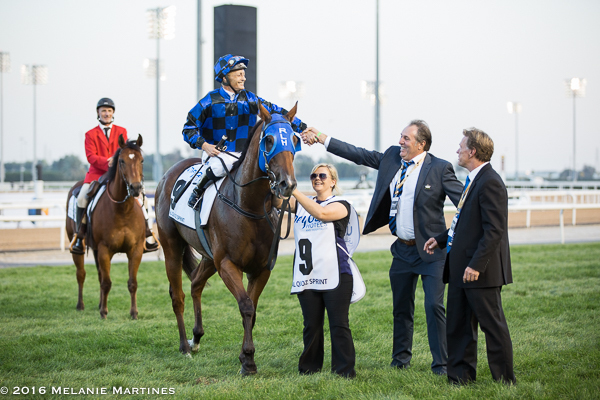 As they charged down the stretch splitting into two group, #9 Buffering on the grand stand side took the lead over Ertijaal and Peniaphobia with a victorious win for the Aussie's! Jockey Damian Browne elated with the win! Team Buffering loud and proud! Cute girls in beautiful colored dresses performed with a singer on the apron at the grandstand area between one of the races. Race 6, the Golden Shaheen with a purse of $2 Million at 6F. 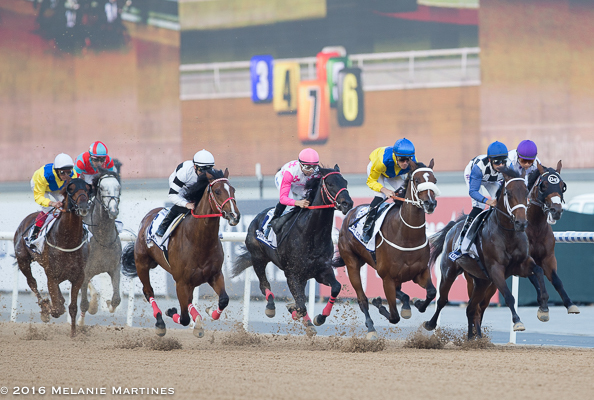 Stride for stride #7 Muarrab and USA's X Y Jet dueled to the very end with Muarrub eventually crossing the wire in a near miss for USA. 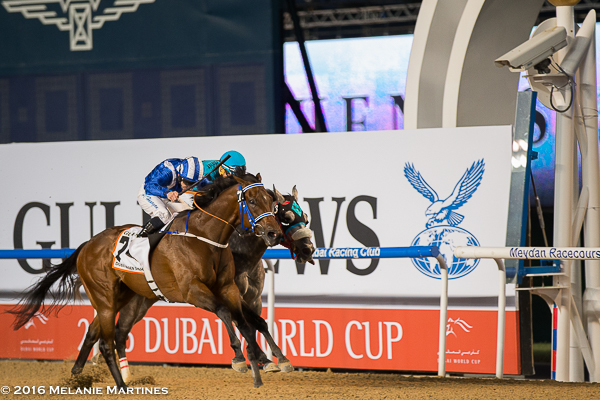 A thrilling finish in the Golden Shaheen! Look how close that was! 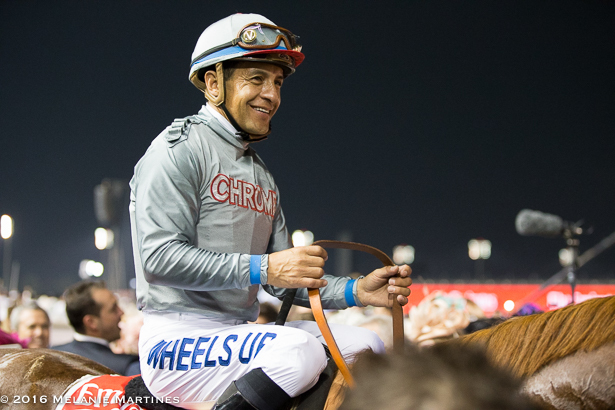 Jockey Paul Hangan waves to the crowd. 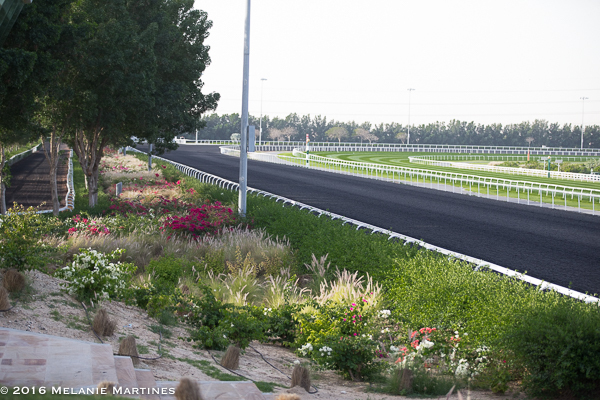 Race 7, the Dubai Turf with a purse of $6 Million dollars to run at 9F. 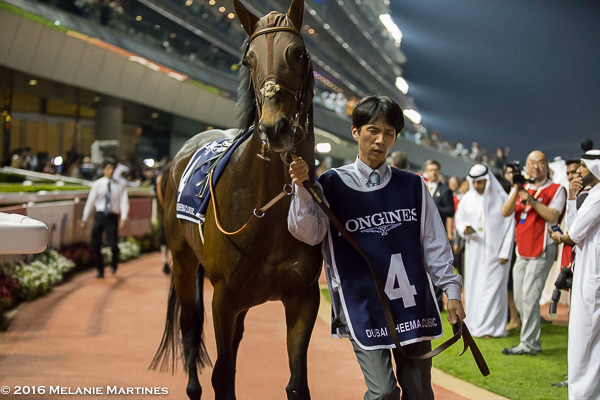 Here is the winner Japan's Real Steel before the race. 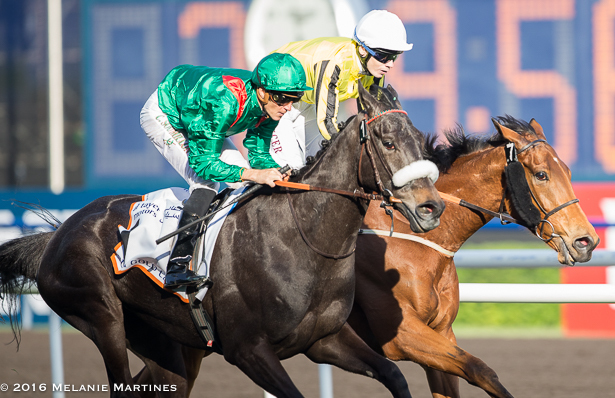 Japan's Real Steel takes the Dubai Turf over Euro Charline and Tryster. Fans for Japan cheer on Real Steel. Japan with another big win! 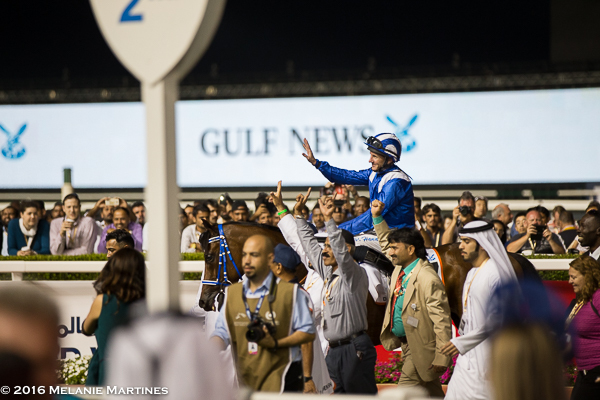 There's a little smile from Jockey Ryan Moore after winning the Dubai Turf. 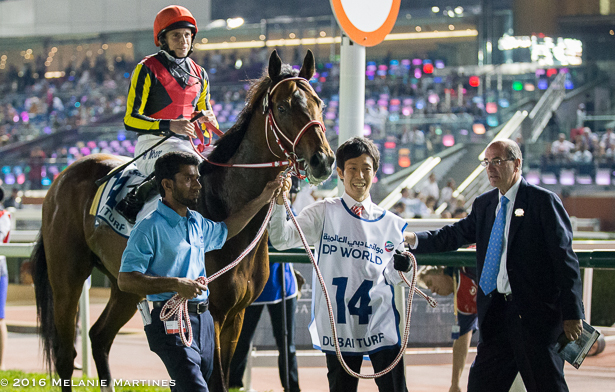 Japan's super-star Duramente ripped a shoe off before the race, and was unable to be re-plated. He was not comfortable with running in only three shoes, but still ran well for second. 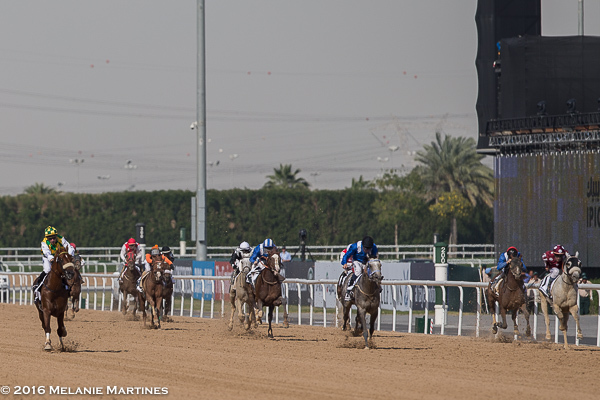 And they're off in the Sheema Classic! Highland Reel went straight to the lead with Postponed sitting 4th. Here Postpone is driving for home, and was too good for the rest of the field. 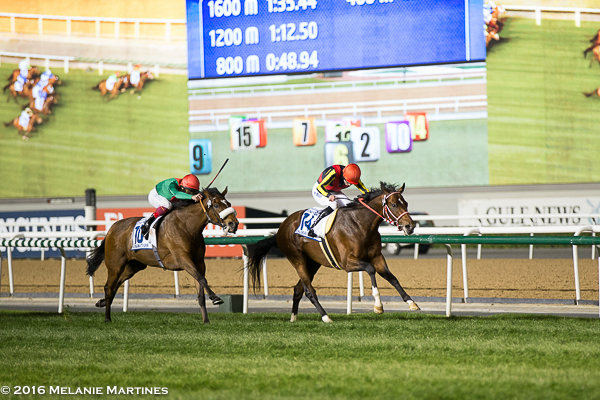 Postponed wins the $6 Million Dubai Sheema Classic! 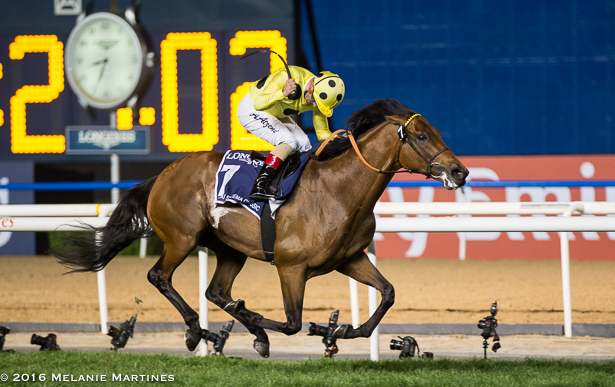 Jockey Andrea Atzeni after the race. 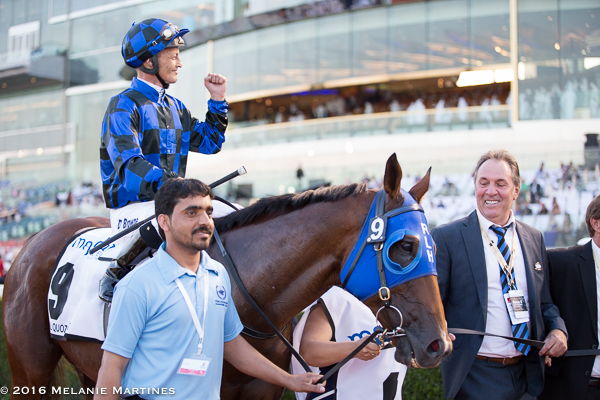 A special kiss for Sheema Classic winner Postponed. 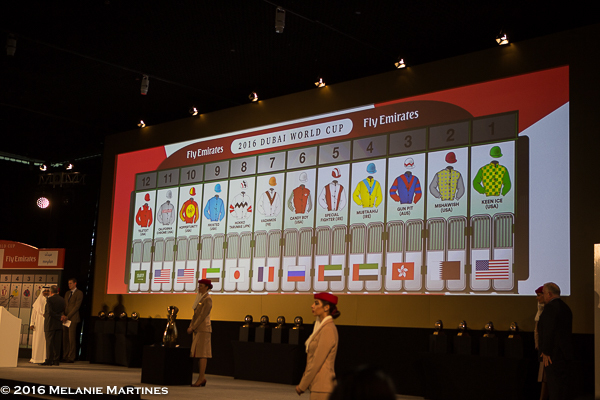 Race 9, the Dubai World Cup. 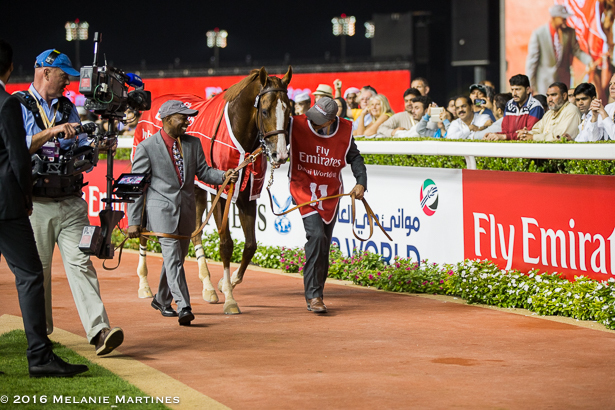 The richest horse race in the world with a purse of $10 Million dollars. 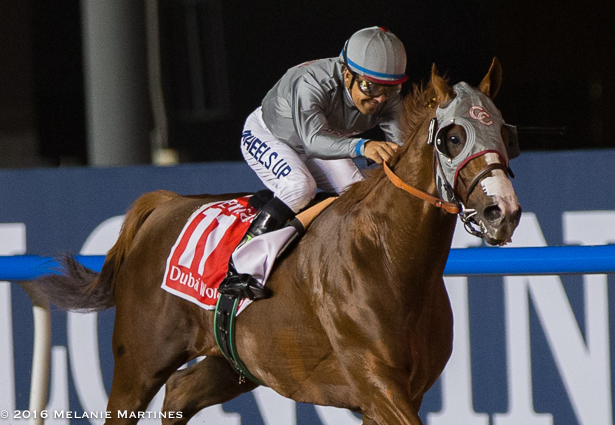 All eyes will be on California Chrome in hopes that he could show his best at 100%. 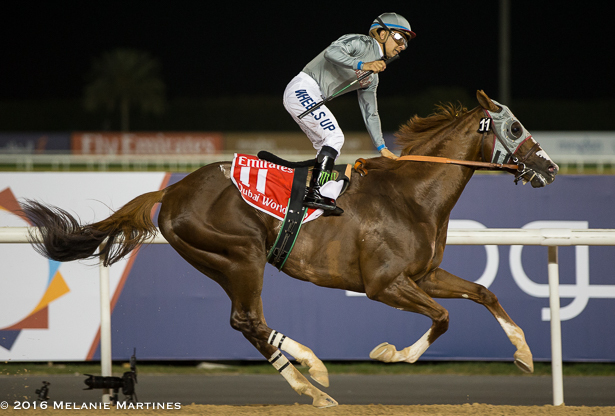 Jockey Victor Espinoza and California Chrome takes the lead, and never looks back. 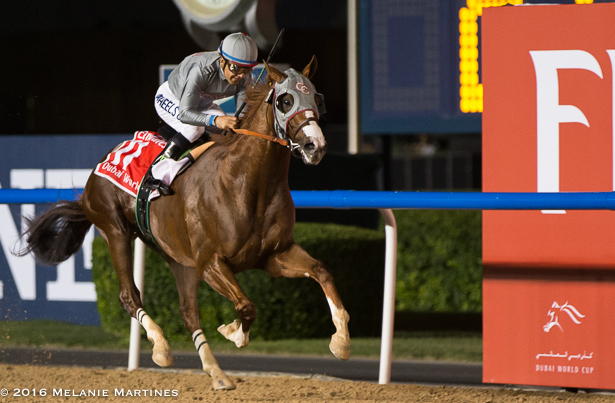 Jockey Victory Espinoza, “I was just trying to keep my balance and not move my body. I wasn’t that concerned that the saddle slipped, I just kept looking forward and thinking: ‘Where’s the wire’." Trainer Art Sherman getting hugs. 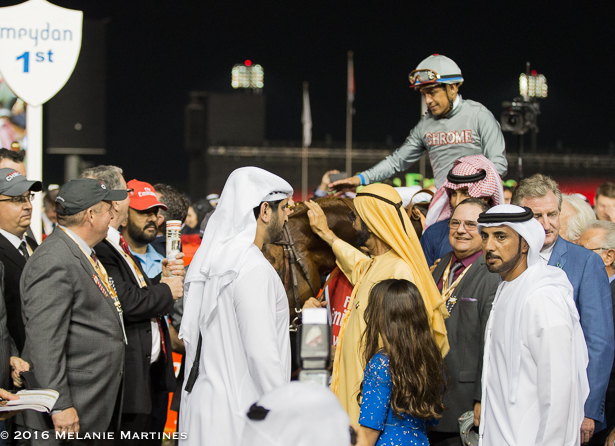 His highness Sheikh Mohammed bin Rashid Al Maktoum (in yellow) pets California Chrome in the Winner's Circle. Exercise Rider Dihigi Gladney and Groom Raul Rodriguez Walking off with the champ! Melanie is an avid horse racing fan. She first fell in love with the sport in 2009 when she was first introduced to an article about the Pamplemousse. Her first Derby love was I Want Revenge after his spectacular win in the Wood Memorial, and would tell you that her favorite Thoroughbreds are Zenyatta, Mine That Bird and she's been following Mucho Macho Man since he was 2 years old. Her passion has led her to become quite knowledgeable of the sport, and has read many books on pedigree/conformation/dosage, handicapping and about great horses in racing history. 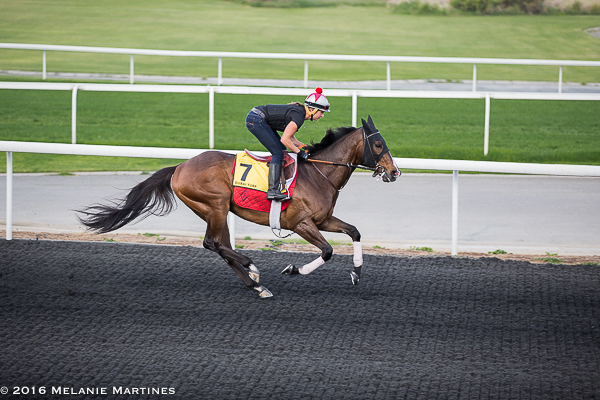 She learned how to handicap a race from old-timers in the sport, and has a few favorite angles when picking a winner. Having a creative side to her, she is also a professional Photographer. 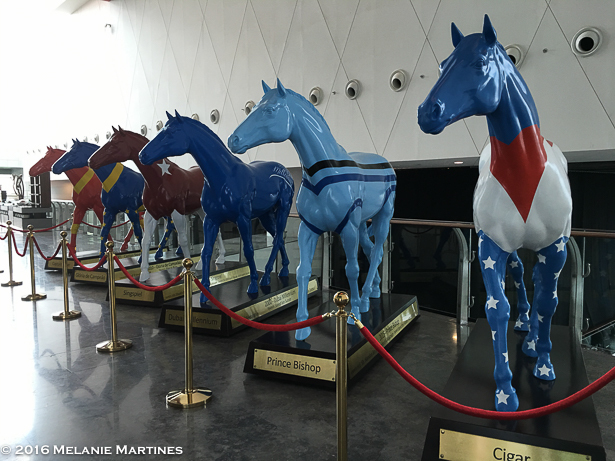 She discovered that she was able to combine her passion for photography and horse racing and loves traveling to the California race tracks as much as she can. 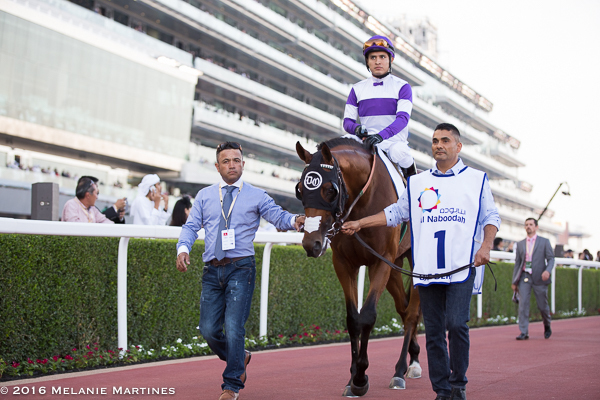 After returning from the Breeders' Cup races at Keeneland Race Track and experiencing the sports' first "grand-slam", the next planned adventure on her list will be Dubai for the World Cup on the last Saturday in March of 2016. 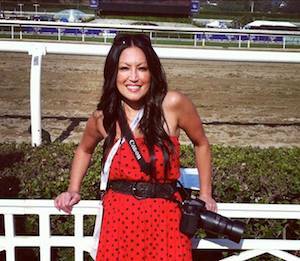 Her dream job would be behind the camera at a race track photographing everything that goes on throughout the day. Originally from Hawaii, Melanie lives in Henderson, NV with her daughter Kaela who currently attends college. She is a graduate of UNLV and when she is not at the race track she is the Executive Assistant to the CEO of a Digital Marketing company in Las Vegas.